Halloween? It's all the year round on 18th Street, where this skeleton is a permanent presence. I applaud its tenacity. I ran into Connie at Fifth and 9th on Sunday, and asked her if she was planning on dressing up. "Honey, Halloween's nothing to me. I dress up every day of my life." Got my shoes fixed outside the laundromat on Eighth, on the same block as the Great Eagle Photo Co.
We walked farther along the avenue, then swung back for dumplings and noodle soup at Kai Feng. Just when you need at the time of the year when the the temperature drops and the daylight wanes. Food to feed the soul. Earlier this year I spent some time learning about the squatter settlements in Red Hook and Gowanus, which were established in the nineteenth century, and later, during the Great Depression. In the course of looking up newspaper articles about these communities, I came across a 1934 Eagle story about another small Depression era settlement nearby. This one was along the waterfront at 37th Street, in a Sunset Park neighborhood with a sizable Scandinavian population. 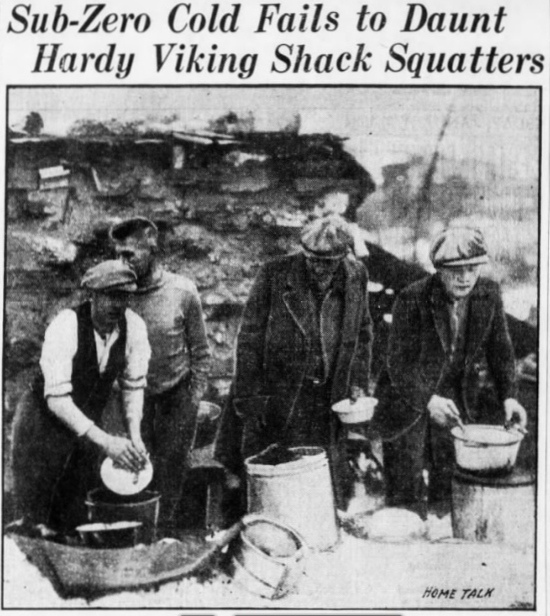 "In a lot littered with tin cans and cast-off automobiles," ten men are described as bearing the bitter January weather without complaint "in true Viking fashion." 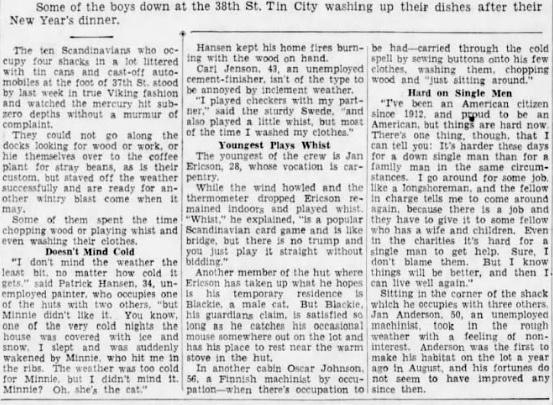 According to the Eagle, the men, along with their cats, Minnie and Blackie, occupy four shacks, & fight off the subzero temperatures chopping wood, playing whist or checkers, and washing and mending their clothes. 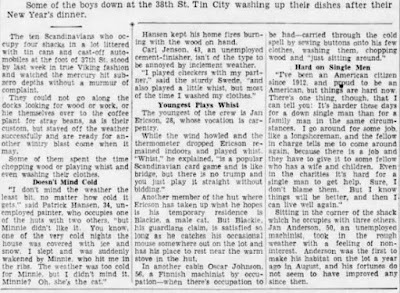 It is too cold, the rather too jocular reporter notes, for even these hardy men to look for work, or head to the coffee plant to search for spilled beans. The various professions of the unemployed men, two of whom are described as Danish & Finnish, include painter, cement finisher, and machinist. One of the men, Oscar Johnson, 56, feels his existence is all the harder for being a bachelor, as preference in hiring is given to family men. "I've been an American citizen since 1912, and proud to be an American, but things are hard now. There's one thing, though, that I can tell you. It's harder these days for a down single man than for a family man in the same circumstances. I go around for some job like a longshoreman, and the fellow in charge tells me to come around again, because there is a job and they have to give it to some fellow who has a wife and children. Even in the charities it's hard for a single man to get help. Sure, I don't blame them. But I know things will be better, and then I can live well again." As I'd been reliably informed a couple of weeks ago, The Fifth Estate is now comedian Jennifer Salzman's club Salzy's, which is apparently set to open shortly. Certainly a change in tone from The Fifth, I'd imagine. An avenue over, at Fourth & 15th, A&E Supply Co. has some pre-opening promo on their store windows, with a New Brooklyn Slamming Cocktails Play Harder Proud Pigs Humanely Sourced Single Origin Keeping it Real brio. A couple of days ago, on a whim, I typed "Halloween" into the search box of the New York Public Library Digital Collections online website. The first few images that appeared were holiday postcards from the early 1900's. One of them showed a pursed-lipped pumpkin that bore a troubling resemblance to Donald Trump. Apart from this one, they were charming enough, but as I scrolled down, the search results transitioned to a set of black and white photographs that jumped right off the screen. Kids from a bygone decade, in Halloween costumes, posed against a background of frame and brick buildings. 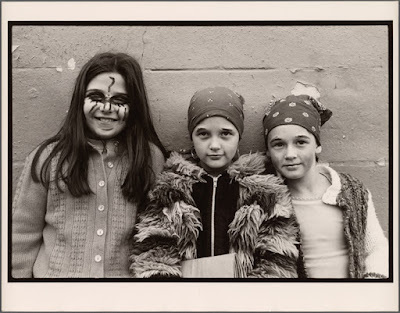 How they caught my eye - these devils, these superheroes, brides and ghosts, their futures undetermined - facing the camera with all the sudden sense of power a costume brings, and sometimes (surprisingly) revealed without their masks in all the tenderness of childhood. 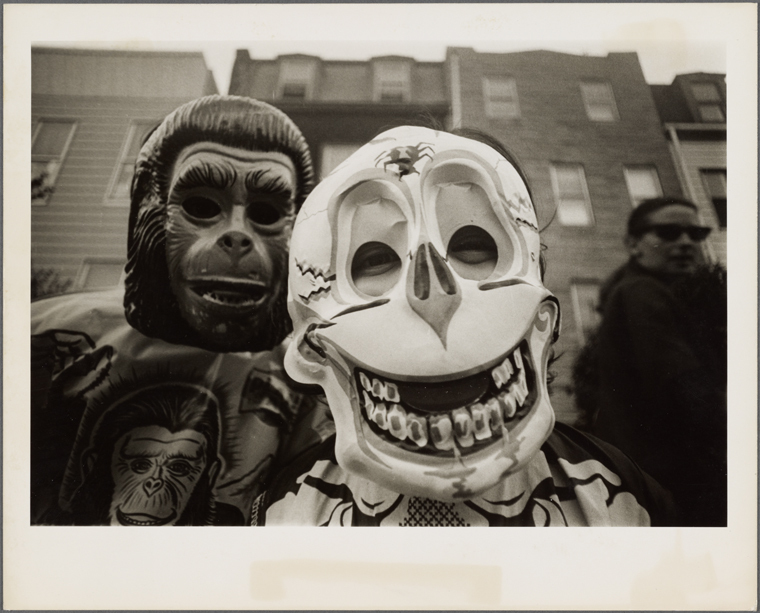 The pictures summoned up the pure magic of Halloween, when, for one day & night at least, you could step out of your day-to-day life and reveal your deeper, darker, bolder self. That brief time when the world shifted balance. 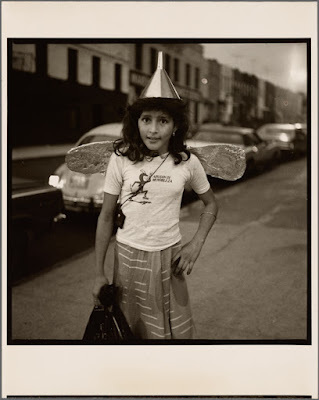 The pictures were almost entirely adult-free, giving the suggestion of greater liberty for a kid on the streets of the city back then & they invested these miniature angels & demons with tremendous dignity, gravity & sweetness. They also felt like the work of someone who understood children, could talk to them, and take them seriously. I couldn't stop looking at the pictures, and the more I looked, the more the low-scale landscape looked familiar. I supposed it could be one of a number of neighborhoods in Brooklyn or Queens, but yes, it really was close to home - South Brooklyn in the teens and twenties blocks. By the expressway on Sixth, looking up 19th from Sixth to Seventh, snippets of schools & spires, doorways & chain-link fencing, flashes of a past that was still recognizable today. The photographs were taken by acclaimed photographer Larry Racioppo, between the years of 1974 and 1978. The kids in the pictures would be in their forties and fifties today. 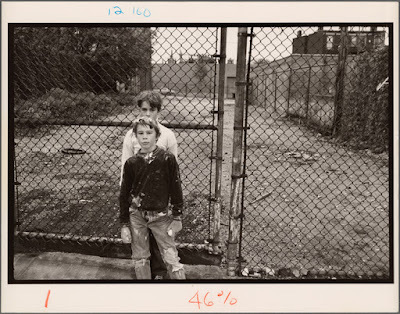 Racioppo, son of a longshoreman, grew up in the area, and one of the buildings he lived in, at Sixth and 17th, was torn down to make way for the Prospect Expressway. 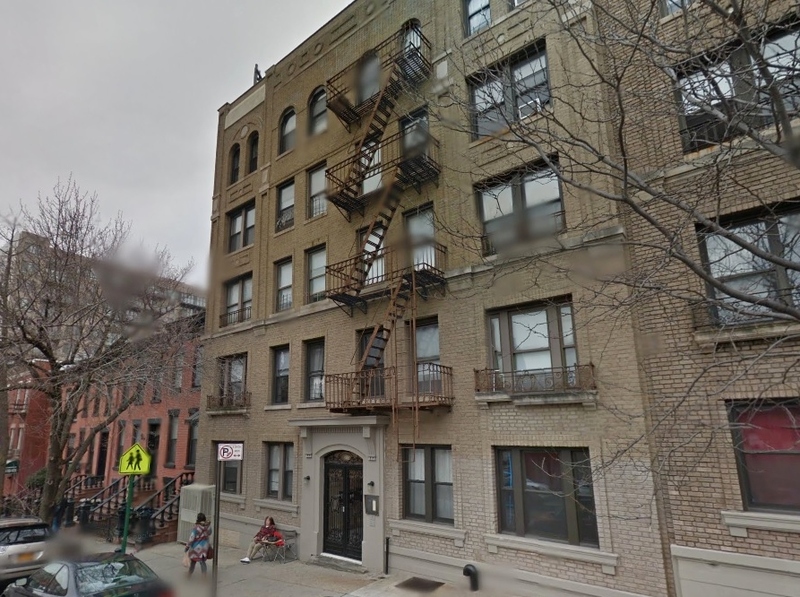 His parents later moved to Sunset Park, but the hub of his Italian-American family life remained nearby, on 18th Street, and he has stayed closed to his old neighborhood. 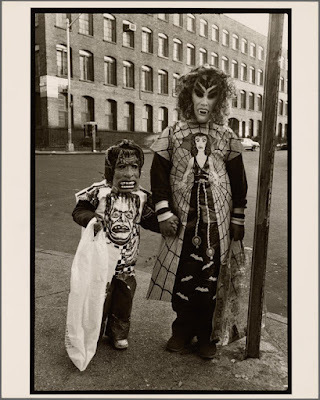 After a spell in California in the late 60's, Racioppo returned to live in Park Slope, and with no formal training, decided to become a photographer. He supported himself by various means, as a cab driver, bartender, & construction worker. He also worked under the auspices of CETA, a federal jobs program, which was created in the 70's as an heir to the WPA program. 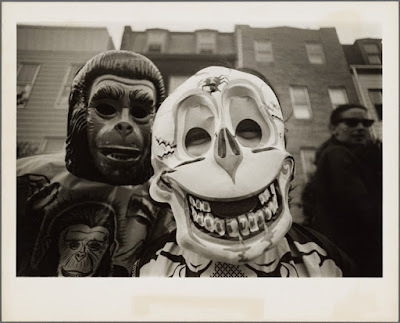 Some of the 70's Halloween photographs were taken during his time with CETA. Eventually Racioppo found work with the City, as a photographer for the Department of Housing Preservation & Development, which offered him the opportunity to further develop his art while earning an income, and to travel all over the city with his camera. Today he lives in Rockaway. Racioppo's work has captured many aspects of city life, including the myriad faces of religious observance, the vernacular of street basketball, the grandeur of abandoned movie theaters, and the rituals of the Williamsburg Giglio. 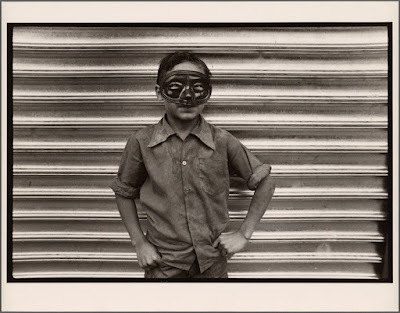 His photographs are in the collections of many institutions, including the Brooklyn Museum, El Museo Del Barrio, The New York Historical Society & the Schomberg Center. Multiple honors include a Guggenheim Fellowship, & awards from the National Endowment for the Arts. Racioppo continues to be fascinated by Halloween, and is always out with his camera on October 31st. 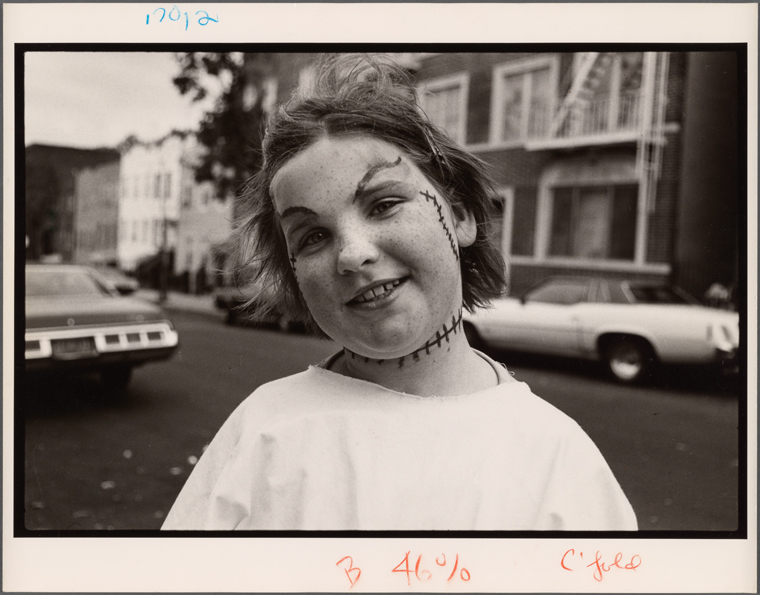 The 70's Halloween pictures appeared in an eponymous book, published by Scribner in 1980, and The Word on the Street: The Photographs of Larry Racioppo, was published by the Museum of Biblical Art in 2007. 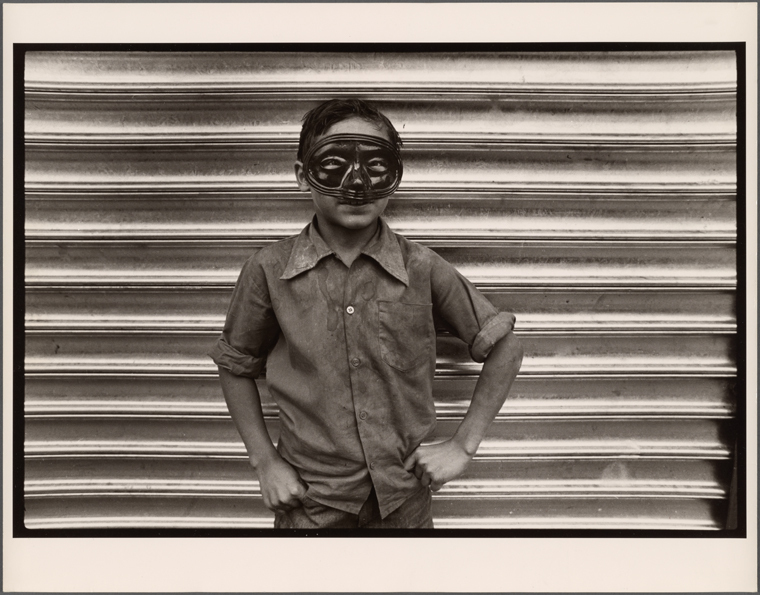 His work is currently on view in the exhibition Five Cents to Dreamland: A Trip to Coney Island, at The New York Transit Museum, & will appear next week in a group show, Sanctuary, at the Tabla Rasa gallery in Sunset Park. To Halloween again. To the plump-cheeked cowboy pointing a pistol at the camera. To the slender girl in an anti-hero Chapulin Colorado t-shirt & a fragile-looking pair of tin foil wings. 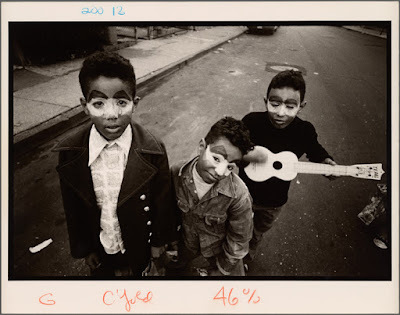 To the three boys with tears painted on their cheeks, one quite formally dressed in a broad collared shirt & jacket, the second with a head-turned hint of a sneer, and the third strumming a tiny toy guitar. To Bambi, the Bionic Woman, & Cinderella, masks on & off. 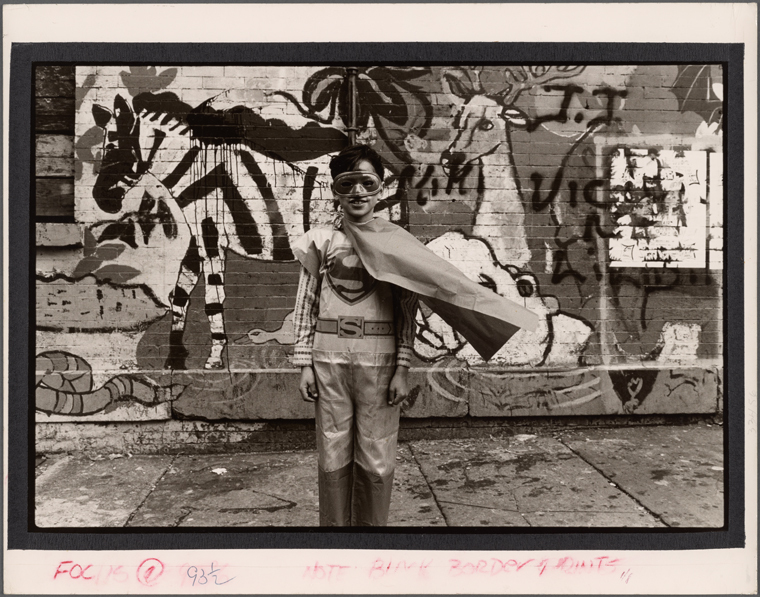 To the Rubber Devil, whose mask seems as much a part of the animal world painted on the wall behind him as of a block in Brooklyn. To the Bride of Frankenstein, who looks far too beatific for any remotely horrific deeds . To the ghost, in street clothes except for a veil of what looks like net curtain scooped up and fastened under his chin. 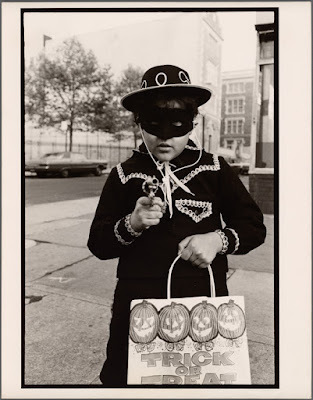 To the kid in the black mask, hands on hips & exploring machismo, & to the shaving cream fighters, in no need of costumes to assert their presence. To little, beaming Lucy and her larger, scowling companions, who look as severe & repressive as Sendak's elderly aunts or grandmothers. To Doctor Zaius, revealed as a bit of a wise guy, & to Superman, half-smiling, with his plastic cape rising in the breeze, which seems to arrive right on cue. To short figures with large, masked heads, that look like creatures out of latter-day Grimms. To inexpensive costumes & home made touches, as powerfully affecting as anything fancy. To dressing up, hitting the streets, and being your heart's desire. Many thanks to Larry, for giving me permission to include his photographs here, and for taking the time to talk. For more information on his work, read here. A new sign at Fifth & 9th replaces one for phone & computer repair, phone cards, candy & smokes. It's almost a classy sign for a smokeshop. There are certainly lots of these kinds of businesses around these days - so many in fact, that one wonders how they pay the rent. Another one arrived a couple of blocks south recently, replacing the Franchezka Unisex hair salon. The Fifth & 9th corner wouldn't win any beauty contests, with Deals & Discounts (DII), a deli & smokeshop, the Park Beer Store (formerly just the plain S&P newsstand) & a bank holding the corners, but despite an overabundance of beer & nicotine, I like the way the intersection hasn't at least gone all upwardly mobile on us. Beauty isn't just in looks, it's there in spirit & resilience, and the feeling of a place that attracts all-comers. You get that here, with streams of people passing through, arriving via bus or train, or on foot. It's a hub. The discount store & fast food are popular draws. Daisey's diner, Smith's (the last old bar on the avenue), the Square Store menswear shop & the Fifth Avenue Diner are all close by, along with a liquor store & the Record & Tape Center, blessedly still hanging around against all expectation. Pharmacies abound, most of them with sluggish, indifferent service, though Neergaard, the king of the bunch, is a happy exception. El Viejo Yayo II restaurant is just up 9th, and a supermarket just beyond that. There's still affordability at the crossroads, and a blessed diversity of people passing through. Preachers still plant themselves on the Chase corner from time-to-time, and you'll still find Connie, our resident diva, panhandling, at 70, inside the bank itself. There's a bit of hustle left here. The corner has weathered the ups and downs of decades, lost cinemas, department stores, an elevated train line, and more, but it hasn't lost a popular touch. And the intersection marks a kind of territorial border for me. Below 9th, I'm on home turf. These signs went up yesterday, as speculation about commercial change at Hamilton Plaza has become more intense. Show some support to the guys here! Infinite upon infinite: New York City in maps. A new atlas highlights the city as ‘a place that contains worlds’ (Curbed) A beautiful Nathan Kensinger piece on Rebecca Solnit & Joshua Jelly-Schapiro's new book, Nonstop Metropolis. A brilliant book - buy it! I had planned to get in plenty of Open House NY & Gowanus Open Studio visits this weekend, but other activities got in the way. I did, however, get to a couple of events. On Saturday I made it to the Municipal Building Library, on Chambers Street, where a sale was taking place, and spent a good hour rummaging in boxes of de-accessioned books. It was important to maintain self-control in these circumstances - did I really need a set of fire chief manuals, or a small 60's volume on New Jersey's Financial Crisis? I came away with four books: Stud Terkel's Division Street (who could argue with this choice? ), Academy Lectures on Lie Detection (1957), a 1970's journal on New York arts, and a copy of truly dreadful love poems inscribed to Ed Koch. I also got three beautiful poster-sized blow-ups of city photographs, of Chinatown in 1936, and work on the Williamsburg & Queensboro bridges. And then it was a walk home across the Brooklyn Bridge. 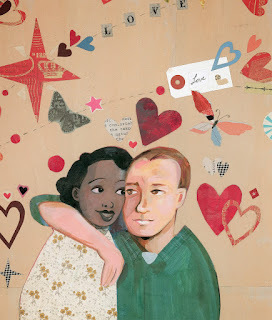 Yesterday, towards the end of the Open Studios weekend, I stopped in at MadArts, at 18th & Fifth, where a visit to award-winning artist-illustrator Sean Qualls' studio was a real highlight. Part of what fuels my art (and illustration) is the desire to shine a light on those who have been forgotten by history, underrepresented or misrepresented. My goal is not to merely tell their stories but to reframe them and their lives. By reframing, I mean looking at people and events from a different vantage point and thereby changing the way we perceive them, reminding us that identity is perception and therefore malleable, not static. Qualls' illustrations are bold, multi-textured and visually sumptuous, and it's exciting to see up close the process by which his picture book art is created. More on his work here. As I waited in line to pay for my purchases, the guy behind me, whose apron identified him as an employee, was joking around, gallows humor-style, with other workers. "What do we do with the uniforms tomorrow? Throw them in the trash or burn them?" Soon I was chatting with him too. As a part-time employee, ready to retire in a couple of years, he wasn't too worried on his own behalf about the store's closure. But what about the others, he said. What about the minimum wage checkout clerks? What about the butchers, who'd worked there for years, and were earning upwards of thirty dollars an hour? How would they support their families now? The promise of severance pay had been withdrawn, though the company top brass had lined their own pockets with fat, farewell checks. Recently, there have been signs of action down on 12th. Is a market coming back? On Monday, Park Slope Stoop reported on word that a supermarket - possibly a Stop & Shop - was likely to be opening again on 12th Street. I thought a property deal might be in the works, but saw nothing recorded online. On Friday, though, Crain's announced that the Meral/Joyland developers had bought the Hamilton Plaza Shopping Center for $35M. The 4.6-acre site, located at 1-37 12th St., contains a parking lot and a 125,000-square-foot building; however, the new owner has the right to construct an additional 315,000 square feet of commercial space, which could be retail, office or a hotel. The new owners will likely maintain the existing building, because if they were to replace it with a new structure, they would not be able to replicate the 50,000-square-foot space that housed Pathmark. Under current city law, the maximum size allowed for a single retail tenant in a manufacturing zone is typically 10,000 square feet. The property was also home to a handful of smaller tenants, including a gym, a liquor store and a Dunkin' Donuts. The Big J liquor store (we're fans) & Dunkin', and vision & dental centers are long established tenants at the site, but the national chain Retro Fitness arrived recently, at the end of last year. We're certainly not lacking for gyms around here, with other new arrivals including an iLoveKickboxing & an in-the-works Crunch. Of the smaller tenants in the Plaza, I'd say Big J & the dental/vision centers stand on shakiest ground, but I hope they manage to stay. I'm excited about the rumors of a grocery store coming back - just fantastic news. If we can a get market with fair prices, and a good selection of fresh food, this will be a real boon to area residents. It will also mean the restoration of jobs at the site, most likely with union protection, but I'm not sure if Local 1500 will have any means to help those Pathmark employees get their jobs back. I hope so. "Great improvements are making in the vicinity"